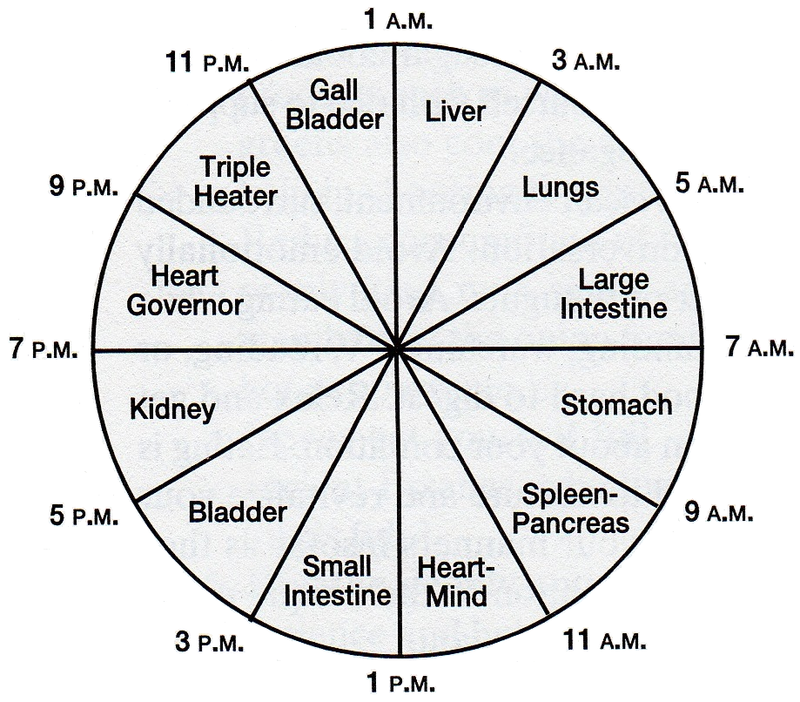 The Chinese clock is an ancient observation that the body’s internal organs have peak activity during two-hour intervals. This theory also suggests that an organ’s minimum activity is twelve hours away from its peak interval. For example, the peak activity of the stomach is from seven to nine a.m., and its minimum activity is twelve hours later from seven to nine p.m. The further away from peak liver activity the meal is taken, the more completely the liver can perform its several hundred functions. If the last meal is eaten at six p.m., seven hours are available for food to go through preliminary digestive progresses. Since grains and legumes stay in the stomach for upto three hours, the remaining three hours or so in the small intestine for assimilation is none too long; the products of assimilation must then be processed by the liver. Thus, many Far Eastern spiritual practitioners eat one meal a day before noon. In this way there will be at leat twelve hours before the liver has its greatest activity. The types of food eaten on a single meal plan can vary greatly since there are almost twenty-four hours to complete digestion. Some kinds of food that present difficulty because of their long digestive time can actually be beneficial to people with a single meal schedule. For example, the peanut greatly slows the metabolic rate; this effect poses a problem for those eating multiple meals. However, peanuts are traditionally sought after by those eating once a day. Foods such as the potato which build the yin fluids are valued since the body contracts and easily dehydrates during its day-long fast; dark leafy greens are also emphasised since these help maintain the body’s fluids. When the single meal is eaten within an hour of noon, it falls during the heart-mind time interval. At this time intuitions are heightened and choices for what is eaten and how much are clearer – an especially important consideration when there is only one oppurtunity each day for choosing foods. This example of one daily meal – and the way it complements a lifestyle centered upon self-awareness – is important since it sets the groundwork for understanding more common eating patterns. It illustrates two central ideas: one, that eating late at night can cause the liver and its subtle metabolic processes to work less efficiently; and two, that with less food one generally has more energy, greater clarity, and a need for far less sleep. However, the daily single meal is not recommended for those without strong discipline, since they may eat two or three meals’ worth of food at the single meal. Otherwise, it is a good practice for nearly everyone one day of the week – a day to rest the digestive organs with one simple meal. The two-meal daily schedule is optimum for most people who have adjusted to a grain-and-vegetable diet. In the morning, there should be an hour or two after rising before eating so that the body and internal organs can gradually adjust from dormancy to a state of more active energy. In any case, wait until hungry before eating. Often hunger will not occur until several hours into the morning. According to biological rhythms portrayed by the Chinese clock, the hours between seven and nine a.m. are the optimal time to eat, since they are the most active time for the stomach, althought nine to eleven a.m. – the interval when pancreatic activity is emphasised- is also a good time, if this is when hunger signals. This meal must be moist enough to help with morning dehydration, and must also have sufficient calories, protein, and corbohydrates to support one in the warmest and most active part of the day, the afternoon. The first meal should be larger than the second, and should be prepared with more water…In general, the first meal of the two-meal schedule can contain lightly cooked or raw items. The second meal can be in the mid-afternoon or later, preferably before sunset or seven p.m., whichever comes first. With sunset the body recieves the signal to begin more internal metabolic and hormonal processes, and the stomach is considered an exterior organ (compered with liver or pancreas). Seven p.m. also initiates the weakest period of time for the stomach. We have seen the best therapeutic results from eating the last meal earlier in the afternoon, around three or four p.m.. This allows a good nine hours before the time of heightened activity of the liver. As the second meal is moved later in the day, which is necessary for many working people, its quantity should become less. When later meals are eaten, it is best to stay up for at least four hours afterwards. The last meal should be smaller in quantity, since the inactive part of the day is approaching. It should also contain more cooked food because of the night’s cool and internal qualities. Therefore the last meal naturally includes inner-directing food: root vegetables and concentrated proteins such as lentils or tempeh can be emphasised. These are general tendencies, and do not mean that the first meal cannot contain proteins and root vegetables. The three meal per day plan is perhaps most practical for the greatest number of people. When one has grown up with the rhythm of three meals, it is best to stay with this rhythm until the body signals it is time for a change. This normally occurs when the pancreas, liver, adrenals, and other organs are sufficiently healed so that blood sugar levels are stabilised. Once stability has been reached, one will usually be hungry only two times a day. The three meal plan reflects most people’s low blood sugar conditions, and also clearly delineates the three periods of the day. Optimally, the first meal is taken during the stomach interval between seven and nine a.m., but of course not until hunger is felt. Like the first meal of the two meal plan, it is ideally warm and prepared with ample water, but it does not need the variety of raw or lightly cooked items since it only takes one through the cooler part of the day. This should be a simple meal. The second meal, usually at noon or shortly thereafter, can be the largest meal of the day. It requires more variety, and for those who are neither cold nor deficient, it is the best time to eat cooling food (such as salad) since it must balance the hottest and most active part of the day. The afternoon is when blood sugar levels dip to their lowest point. Pitchford, P. (2002). Healing with Whole Foods: Asian Traditions and Modern Nutrition. Third Edition. North Atlantic Books: Caliornia.